In this monograph Catherine Opie juxtaposes a new series of intimate and political photographs, In and Around Home, with images from her pre-millennial road trip, 1999. Both of these contrasting takes on iconic American subjects, through the landscape and snapshot forms, are political in nature, representing as they do the perspective of a gay artist, mother and activist at an important moment in her career. Both are deeply personal, and give the viewer a unique opportunity to see both the private and public worlds of the artist through her own eyes. 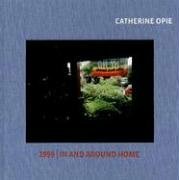 1999 & In and Around Home includes reproductions of every photograph in each series, 72 images in all, each on its own page. The idea to pair the two bodies of work is the artist’s: it was important to her that they be considered together. She also invited A.M. Homes (Safety of Objects, Music for Torching)—an author she has long admired—to write something in response to the work. Homes’s original, previously unpublished short story Let the Dog Drive is included here. Published in conjunction with the Orange County Museum of Art.